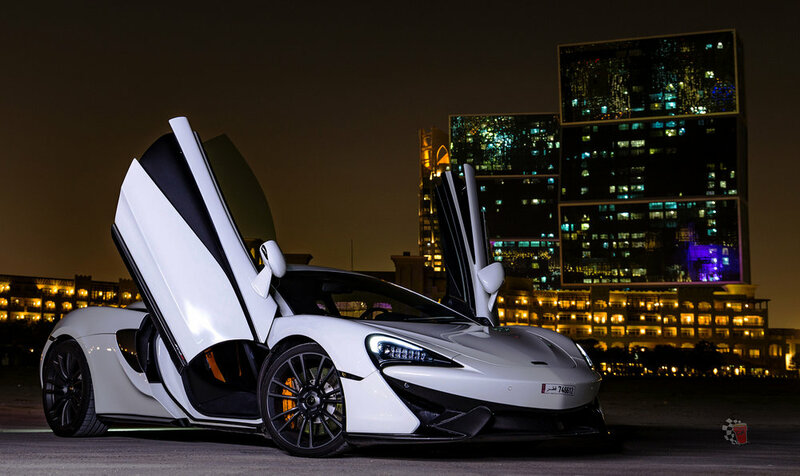 Pin pointed and sharp looking is not all what the McLaren 570S is all about, thanks to Al-Wajba Motors we were able to take it out for a photoshoot and of course a chance to experience the next level of sport car offerings. The word Super-Car is thrown around often these days, many companies are working hard to be unique in the space and dominate the competition. Manufactures are pushing the boundaries of performance with mind boggling specifications and vehicles are becoming more and more track focused but still usable on the street, this is exactly the case with the 570S. Before the driving experience has even begun, you’re taken in by the stunning beauty of this machine, the first impression give you a feeling of excitement and wonder. The beautiful engine on display behind the driver’s cockpit, you know you’re stepping into something special. Pressing the start button, you hear the satisfying purr of this twin turbo 3.8 liter V8 which produces 562bhp. Once you head out and get onto the open road, you can immediately feel the sense of balance in the car. Hitting that gas pedal especially in Sport mode, the level of craftsmanship and the feeling in the driving experience is what makes it special. Simple is not the word to describe this interior, the idea of a vertical screen in the center console is something unique to all McLarens. The cockpit is driver focus and distractions are cast aside in terms of controls for music, air conditioning and so on. Most of the interior is covered in Alcantara, it might just be one of my favorite things in the design. There is also a wonderful mix of 2 tone leather and many options that you can add to the interior. However being a lucky gentleman with a height of 6.2 feet, the limited movement of the driver’s seat and subsequent leg space left something to be desired. Don’t get me wrong, the seats are amazingly comfortable but don’t be fooled by the pictures, its smaller than it looks! GO-KART. The 570S in a nutshell feels like a giant Go-Kart to me. The amount of down force you have you can feel the car sticking to the ground, the steering is so precise it goes where you want almost telepathically, it’s just a work of art. The driving experience left such an impression, I still vividly remember the almost race car like feeling as the car moves around just eating up the open road. The 570S has 3 handling modes Normal, Sport and Track. Normal is very smooth, great for buzzing around town. Sport mode is what I kept it on most of the day to be honest, everything is sharpened up and responses are quicker. Track mode, or as I’d prefer to call it ADRINLINE mode, is the full Monty unleashing the full potential of what the vehicle can do. But really this can only be truly explored on a track, the bumpy streets are not the best place to get the most out of Track mode. I’m in love with the 570S and looking forward to drive more of these amazingly well designed well-crafted machines, enjoy this photoshoot by our talented photography team and we look forward to posting a montage of our experience soon, until the next Night Run, see ya!